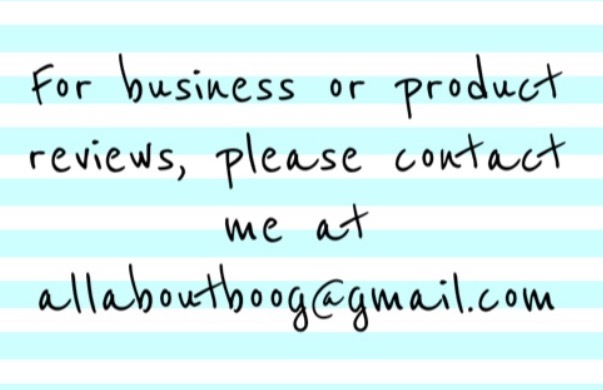 No Matter the Topic, it's All About Boog: Game Changer for Sensitive Skin! A lot of children on the Autism spectrum have sensitive skin. Not just sensitive to things like chemicals (laundry detergent, soap, etc. ), but even sensitive to the textures of certain clothing. We have a "no tag zone" at our house. If a shirt for Boog comes with a tag, it is usually cut off before he ever puts it on. I'm so glad most shirts are tagless these days! But sometimes even when there's no tag, the top part of the back of the shirt still bothers Boog. It's just a sensitive area, and I just figured those shirts were just going to be thrown in the donate pile. 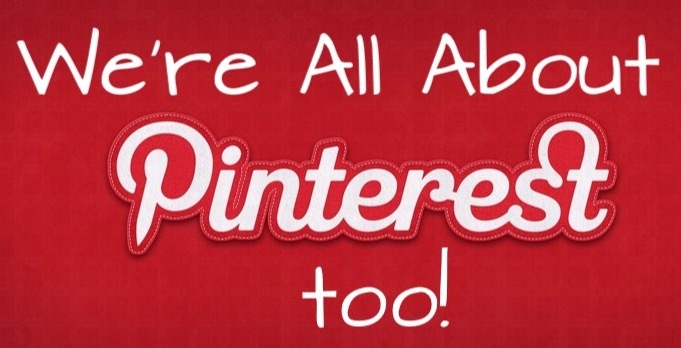 That was until I was reading a random blog one night and happened to see someone comment about this great stuff sold on etsy and I hoped over there to read more about it. 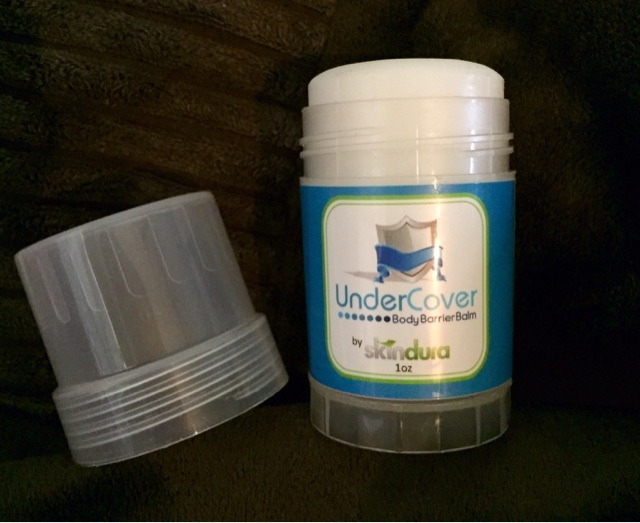 The skin soothing ingredients in Under Cover also moisturize skin that has already been irritated from friction. Here are some other awesome features of Under Cover. It is made of 100% veggie derived ingredients, (no petroleum, no animal by products, no silicone). It’s waterproof sweat proof and resistant to rubbing off, yet still allows skin to breath, unlike many products made from silicone or petroleum. It contains no artificial coloring and won’t stain clothing. 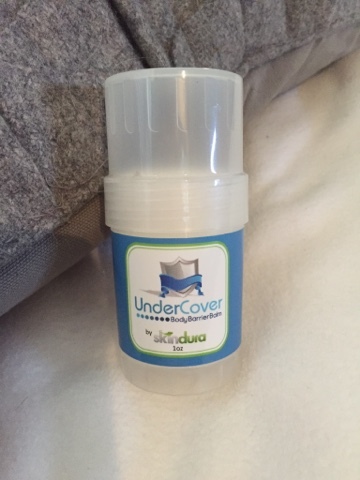 The convenient twist up tube makes applying Under Cover quick and clean. Apply exactly where you need it with no messy hands afterward and it’s portable, so you can take it anywhere. And since Under Cover is invisible on skin and fragrance free, only you know you’re wearing it! Directions: The warmth of your skin allows Under Cover to glide right onto your skin. Simply twist up the tube and rub on areas of friction, clean and convenient! Just don't store Under Cover anywhere that gets really hot as it will melt. If it does set upright in a cool area and allow it to re-solidify, but don't allow it to freeze." Guys, this stuff really works. It comes in a tube that's very much like a deodorant container, but smaller. I simply rubbed it on Boog's upper back and he didn't scratch at that area all day. He didn't come up and want me to scratch it, or change his shirt. Since Boog is non-verbal, I have to watch very closely to see if something is uncomfortable, or bothersome to him. Having "Under Cover" gives me piece of mind that when I send him to school I know he's not stuck with an itchy or irritated patch of skin that he can't reach. I'm so thankful! ***I was in no way compensated for this post. All opinions are my own.